A report from the Radical Independence Conference. 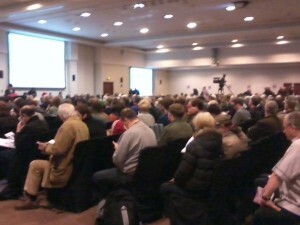 Over 800 people attending the RIC in Glasgow last Saturday certainly thought so. The feelgood factor amongst delegates was palpable as the vast majority left the conference with a rekindled belief in the progressive possibilities of independence and a growing belief that a Yes vote in 2014 was within our grasp. I have to admit that even aging cynics such as myself were somewhat swept away by the youthful enthusiasm and international solidarity so openly displayed, from platform speakers to those participants who had to stand around the fringes of the overflowing main conference suite. After years, or is it decades, of fighting rearguard actions against the relentless assaults on democracy, workers rights and all the social advances of the twentieth century by the neo-liberal New World Order, we began to hear messages of hope and an expectation of a new dawn for the Scottish and international left. As much of Europe descends into acute economic collapse, social breadown and the immenence of fascism, Scotland has an almost unique opportunity to break free of the confines of the British State and the City of London and develop a radical alternative to austerity and capitalism. This emerging narrative of hope is a welcome antidote to the other much circulated story of defeat and pessimism. One of the most important political factors to emerge was the placing of the independence debate within the context of the post-Seattle anti-globalisation and anti-capitalist movement. As Pat Kane has already expressed http://www.thoughtland.info/2012/11/-radical-independence-conference-three-observations.html#more there was a sense of a generational handover to this younger generation of activists for whom personal empowerment and anti-hierarchical processes are inherent in their makeup. For me, this was probably the most significant single outcome of the conference. It was apparent though, at least in the workshops I was able to attend, that the top-table speakers, mainly drawn from the ‘official’ left were significantly out of touch with their audience and the most telling and incisive contributions came from the body of the hall. In the Scottish Republic -A Modern Democracy workshop, four speakers were each given 15 minutes to say pretty much the same things whilst the grassroots sat on their hands. Some of their critiques of monarchy and Crown Powers were quite interesting but significantly none had anything to say about how a modern democracy could actually function. It was left to the contributers from the floor to raise the issues of community-led decision-making and participatory democracy, and, tellingly, to overwhlmingly reject an elected head of state as in any way a progressive or radical idea for a 21st century democracy. The afternoon workshop session on Education and the Future of Work, despite having a six member platform, managed to allow more time for contributions from the floor which probably could have led to a real discussion but for a shortage of time as the day came to an end. Here too, ideas of direct participation in decision-making were expressed from the floor for both the workplace and the school. The need for education in making consensual decision making to allow the breaking down of hierarchies was also a general theme. Clearly the grassroots are more politically advanced than their would-be leaders and have somehow imbibed an anarchistic analysis of political and economic structures. This undercurrent of thought should encourage us as anarchists to take an active role in the development of policies for radical independence and participate in local round table forums to develop the political ideas which will engage and enthuse all those currently dis-satisfied with politics and politicians of all sorts.